In 2015, Walt Disney Company Chairman and CEO Bob Iger announced that a Star Wars-themed land would be added to Disneyland in California. That experience will become a reality when Star Wars Land opens at Disneyland in California on May 30, 2019. The land will open in phases. On opening day, you can live your own Star Wars story and take the controls of the most famous ship in the galaxy aboard Millennium Falcon: Smugglers Run. Food and beverages will be available, and shops will be open. Later in 2019, they will open Star Wars: Rise of the Resistance which will put you in the middle of a battle between the First Order and the Resistance. 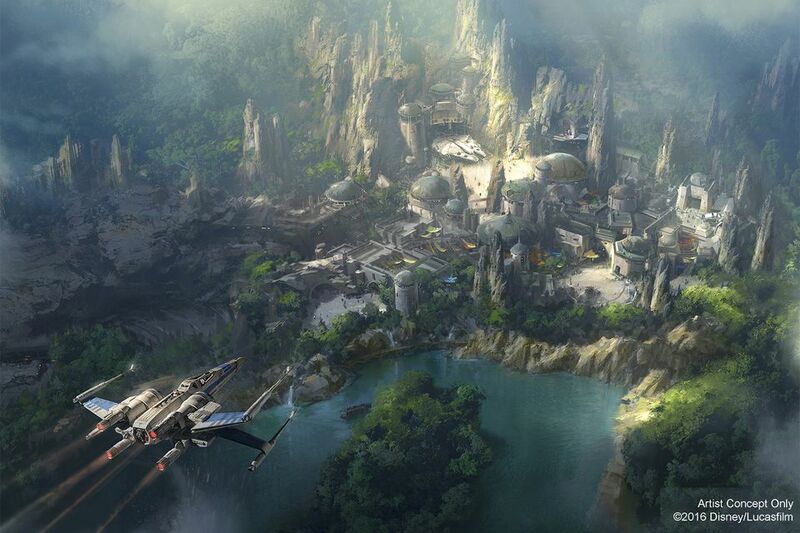 If you plan to visit Star Wars: Galaxy’s Edge at Disneyland park in California between May 31 and June 23, 2019, you will need valid theme park admission, but there is no extra charge for the new land. AND PAY ATTENTION HERE: You will also need to make a no-cost reservation to get in. Check Disneyland.com or the Disney Parks Blog for information about how to make that reservation. If you stay at one of the three Disneyland Resort hotels during these dates, you will get a reservation during your stay (one reservation per registered guest). Also know that Star Wars: Galaxy’s Edge will be open during normal park operating hours, but it will not be included in Extra Magic Hour or Magic Morning. Covering 14 acres, the new land seems even bigger due to the generous use of the same forced perspective effect that makes Main Street U.S.A. seem longer than it is. Plans are also underway for a similar new land at Disney's Hollywood Studios in Florida which will open in August 2019. You can keep up with Disney's latest releases about the project at the Disney Parks Blog. Expect huge crowds at Disneyland all summer long, and possibly lots of cranky visitors who didn't know they had to make a reservation to get into Galaxy's Edge. And know that if you go early, you'll only experience one attraction. You will have to wait until later in the year to enjoy both of the land's signature rides. Based on what happened with Cars Land at California Adventure, it's likely that no matter what happens with ride design and capacity, Star Wars: Galaxy's Edge will be packed to the max for at least a year after it opens. And the signature rides may have two-hour-plus waits for up to two years. You can get your Star Wars fix in Disneyland at the Tomorrowland Expo, in the Star Wars Launch Bay, where you can see props and other items from the films and meet a couple of the characters. The queue for both rides is likely to be rich with detail and not just a long, winding line. Think Tower of Terror or Escape from Gringotts at Universal Studios in Florida. There’s far more in store at Galaxy’s Edge. io9 has a list of no fewer than 77 fascinating things they saw on their preview visit. For an overview of everything you can look forward to from a theme park pro who has seen it all, read this article at USA Today. Opening on May 30, 2019, Millennium Falcon: Smuggler's Run is a flight simulator where guests step aboard The Millennium Falcon and actually pilot the fastest ship in the galaxy, steering the vessel through space, firing the laser cannons, in complete control of the experience. The Millenium Falcon story will also change depending on the outcomes of your actions. You can take a look inside in this article at Entertainment Weekly. Disney says its FASTPASS service, including access using Disney MaxPass, will not initially be offered at Millennium Falcon: Smugglers Run. May the Force Be With You as you struggle for patience while you wait in line. Star Wars: Rise of the Resistance is an immersive attraction that will put you in the middle of a climactic between the First Order and the Resistance and will blur the lines between fantasy and reality. It will open in in 2019, but no date has yet been announced. Plans hint that guests would be guided through long, plot-filled stories before boarding their ride vehicles. That sounds like fun, but it comes at a price: low capacity. MiceAge reports an estimated capacity of no more than 1,500 riders an hour, which is about half of Pirates of the Caribbean. And if you've ever waited to ride Pirates on a hot summer day, that's not a happy prospect. It makes you wonder if you should start standing in line now to get into those attractions within their first year of operation. Galactic smugglers, bounty hunters, and princesses on the run will have a place to go at Galaxy's Edge: Oga's Cantina. It will have a classic "Star Wars" atmosphere, with music provided by the chatty RX-24, the former StarSpeeder 3000 pilot droid from the Star Tours ride, who has re-envisioned himself as the cantina’s DJ. Ogas Cantina will serve alcoholic beverages for the first time ever in Disneyland park, with all of its drink options based on the films. They include a bloody mary-style drink called the Bloody Rancor and a colorful blue concoction that is supposedly bantha milk. Restaurants include Docking Bay 7 Food and Cargo which will serve smoked “kaadu” ribs alongside more traditional dishes. You can find a full roundup of food and drink options at Eater.com.